Velocity Racing is an all girls team competing in the 2018 F1 in Schools competition. We are made up of girls aged 14 to 15 and we are all students at Inveralmond Community High School in Livingston, Scotland. All the members of our team are interested in careers related to STEM and graphics which makes us passionate about this competition. Due to our career interests We have all taken on roles that suit our future pathways as this reflects on our interests, skills and abilities making us a strong, enthusiastic team who work very well together. So far in the competition we secured second place at the Scottish Regional Finals and won an award for Best Engineered Car. This meant that we progressed to the UK National Finals which were held in Silverstone Race Circuit where we competed against 28 other teams from around the UK. Overall we came 8th in the competition and were crowned Scottish Champions and won the award for Best Pit Display. This meant that we qualified to go on to compete in the World Finals of the competition which are being held in Singapore in September 2018. If a person has no dreams, they no longer have any reason to live. Dreaming is necessary, although in the dream reality should be glimpsed. Katie carries two roles within our team she is our team manager and lead engineer. Within these roles she oversees the tasks of each member and ensures that tasks are prioritized and deadlines are created and met as well as improving and maintaining a high level of communication within the team. Although her role is mainly to take lead in the whole team, she manufactures the car, alongside scruitineering it to ensure it is always compliant with regulations; she also worked closely with Amy and Megan to help design the car body. She also worked closely with Beth to design and manufacture our pit displays throughout the competition. In the future Katie's dream job would be working within design or engineering. As our marketing and resource manager, Nicole's role consisted of contacting different businesses for varying levels of partnership. Along with contacting businesses, she also arranged and created the presentation for these and ensured we all turned up at the right place at the right time. Nicole also had an overview of the fundraising for the team and worked alongside our parents who helped with a great deal of the fundraising. Working closely with Chloe, she also took control of the Social Media and Marketing Strategy as well as being the dedicated team member to contact businesses via phone. In the future Nicole's dream job would be within marketing and advertising. As the graphic designer, Beth was in charge of tackling mostly the enterprise side of the team's tasks ensuring everything was quality assured, managing and looking over everything to do with graphic design. Beth also worked alongside the team to come up with our amazing pit displays - one of which won an award at our National finals. She is also in charge of the teams finances and alongside Nicole works on the Return of Investment. In the future Beth's dream job would be working as a Graphic Designer. Chloe is our teams digital expert, working to produce promotional videos for us, and our sponsors. She also works on what gets put into the digital aspects of our pit display such as our ipads and monitors. Along with Nicole she decides what gets put on our social media and regularly updates our website with the latest information. Chloe also gathers the information and statistics for studying our target market to improve our social media and the way we promote ourselves. In the future Chloe's dream job is to be an art teacher. Amy's responsibility was the design of the front and rear wings. She also co-ordinates the testing of the car to ensure we had rigorously tested our car to be the best it could be. With the help of the other members of the engineering team Amy also wrote our hypothesis and how we would undertake the test, then after we had completed them she recorded the experiment and observations that we learned from the test. In the future Amy's dream job would be working within engineering. 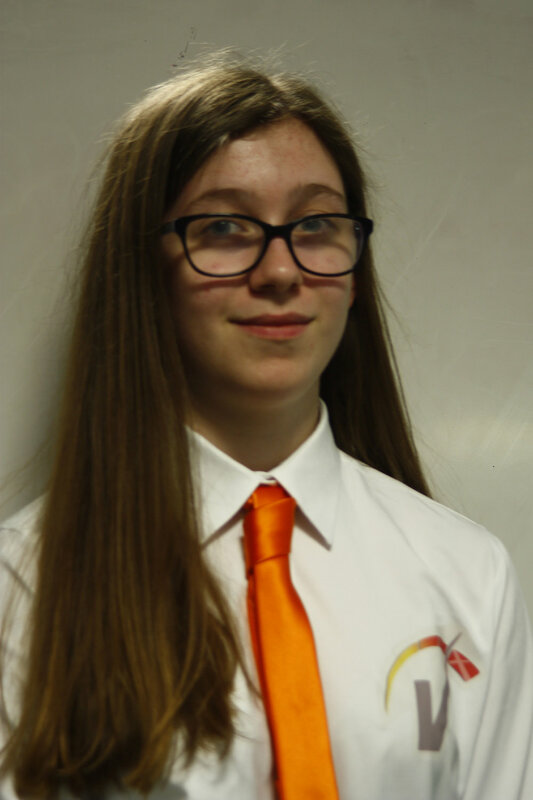 Megan's main role within our team is to design the chassis system of the car and the wheels, as it is one of the most important parts of the car. Doing this; she worked alongside Katie to source the best bearings we could due to us finding through testing these had a huge impact on the speed of our car at Nationals. She also had to ensure we have the ideal amount of bearings in each wheel, the best wheel design, how the entire chassis system adjoined to the rest of the car body, etc. She had to work closely with Amy and Katie to ensure this happened. Megan is also responsible for producing the production drawings of the car as well as our renders. In the future Megan's dream job is to be a primary schools teacher to try and encourage as many students to be as excited about STEM as she is.